I thought I would submit this just for fun when I found your website. My 5 year old male – “Doc”. His registered name is Lebenfreund vom Schlossfelsen. I get SO many compliments on him. His parents are German imports. He is my pride and joy!! Doc actually rivals my boy for most handsome GSD ever! You have an absolutely stunning dog. I'm sure heads turn when he walks by. You have every reason to gloat Doc is a "POSTER PUP". Absolutely beautiful!!!!!!! I must say however that I've yet to see an UGLY GSD. Like you I feel my 6 GSD's are the most beautiful. I will admit though on a scale of 1 to 10 DOC is a 12. 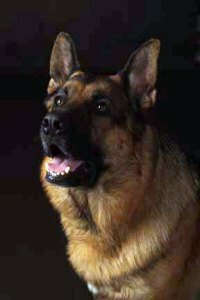 You are very lucky to be entrusted to such a beautiful, handsome German Shepherd Dog. You ever want to get rid of him let me know. I can't imagine that ever happening.